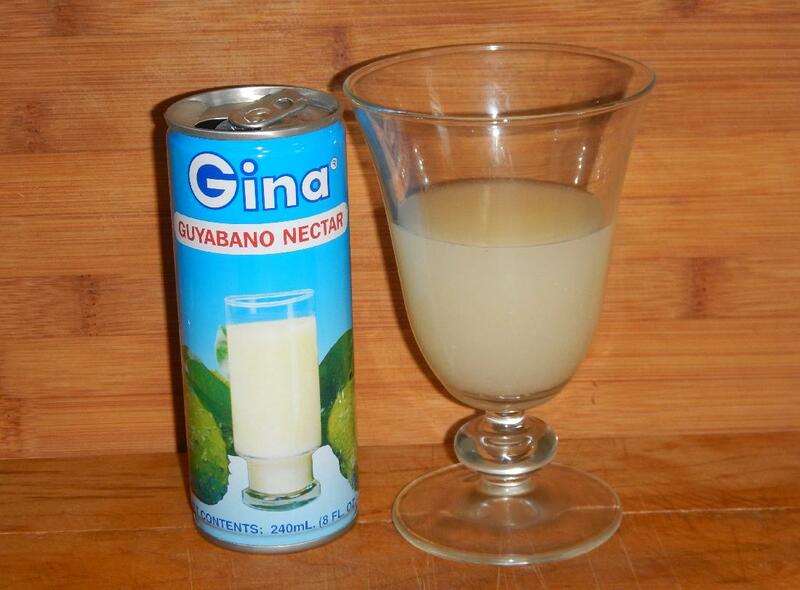 The name ‘Guyabano’ meant nothing to me when I picked this beverage up at our local grocery store and I didn’t immediately recognize the picture on the can that shows a fruit somewhat resembling a Chayote with a nodular, almost spiny skin. As it turns out, however, ‘Guyabano’ is the Filipino name for what is elsewhere known as a ‘Soursop’ and some of my readers will recall that I tried Soursop Juice a while ago. This particular product is a ‘nectar’ rather than a juice, which means it is made from a puree of the fruit with sugar added, and the taste experience was somewhat different. To my mind, this was very like a ‘creamy’ grapefruit juice but with a very floral aftertaste. One of my readers commenting on my Soursop Juice post likened the juice to Persimmon and I would tend to agree that there is a similarity, but without the rather nutty under-taste that Persimmons can have. Anyway, I rather liked it but I also found I just a little too sweet to be refreshing. It would, however, make an interesting cooking medium, I think, and I will report on any experiments along those lines.